I'll be taking a short ski break from blogging. And by short, I mean two or three days, so yes, short. It didn't feel right at least leaving you guys a note letting you know where I'm going though. I'll be in Breckenridge with a bunch of friends. Skiing, snowboarding, and hot-tubbing in the snow. There's also a small winter festival happening throughout the week, and it'll be topped off Saturday night with a chili cook off. It's in honor of Ullr, the Norse god of winter. He was Thor's stepson. I'm generally expecting drunk festivities and good times. Like a mini Oktoberfest with viking hats and snow. Damn I wish I had a viking hat. I'm not the best skier (yet), but anyone looks good going down a mountain in a viking helmet. So, stay tuned, but don't expect anything for a few days. In the meantime, enter my giveaway if you haven't already! 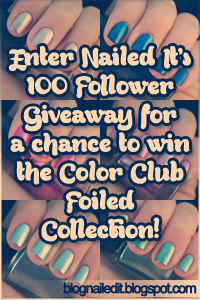 I'm giving away the Color Club Foiled collection (swatched by me here).